"You will die for my art!" "You will die for my art!" The above info came from Zephos, and was edited by yours truly (contact me). The image came from Wikipedia. Mr. 3 is part of the criminal organization/bounty hunting/terrorist group known as Baroque Works. His female partner (B.W. custom is to have different gendered agents paired in teams) is Miss Goldenweek. Mr. 3 relies heavily on trickery to get his assignments done, and prides himself on his ability to kill a foe without ever engaging them in combat. His appearance is a strange one... for agents who hold secrecy as the most important factor, he has his hair done up in a vertical "3" shaped braid blatantly broadcasting his identity. He wears glasses, a bow tie, a striped shirt, and overall gives off the air of a British fellow. His hobby is exploiting his Devil Fruit Power (the Doru-Doru, or Wax Wax Fruit), which is to turn things into wax sculptures. He considers this a form of art. These things, however, sometimes turn out to be people, thus he often kills folks just to get a good sculpture from their wax covered corpse. But such is Baroque Works. It's also worth noting that his wax is as strong as steel. Candle Lock: A tactic where he makes a wax block form around the victims feet. Service Set: He creates a giant spinning birthday cake/pumpkin-esque candle thingy... that gives off a deadly mist which turns people into wax statues. Candle Daggers: Giant Wax daggers, he uses this attack on Dorry's limbs in the Little Garden arc. Candle Harpoon: He creates and fires a wax harpoon. Candle Wall: A wall of wax that Mr. 3 can protect himself with. Candle Champion: A giant wax suit of armor that features wax boxing gloves, this is his greatest technique and the one that brought down the 42 million bounty head. 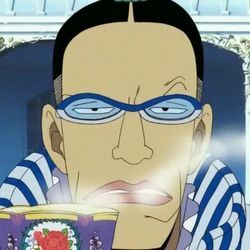 Mr. 3 shows up in the Little Garden storyline and attempts to kill Princess Vivi, the Strawhat crew, and Brogy and Dorry the Giants. Luffy, Usopp, and Karoo are able to foil his plot. Later he reports back to Mr. 0, but is horribly punished. We see him again in a crowd at the Alabasta arcs end, and once more in the manga during a title page serial story. He also loves investigating crimes. The above description came from Zephos, and was edited by yours truly (contact me).